In Pursuit of my Inner Pin-up: Back to the Kitchen! After much thought, and a quick glance at my checkbook balance, I've come to the realization that I need to wean myself away from the Jenny Craig food. As much as I appreciate the convenience, I just can't afford $130-$150 a week anymore. Now that Tax Season is over, my working hours have been decreased and I just don't have as much disposable income as I once did. Also, I'll be honest here, I'm bored to death eating out of boxes! I miss cooking. I miss my own fresh ingredients. I miss eating the same meal I'm feeding my family. Now, I haven't discussed this with my JC Counselor yet, but what I plan to do is continue "using" Jenny for the weekly consultations/weigh-ins because I know that I need the accountability. I'll buy minimal amounts of food, just a few meals per week to keep on hand for busy days or when Beren's eating something I can't/shouldn't have. Otherwise, I'm on my own. Yikes! I'm a bit nervous but also excited and relieved at the same time. So, I'm starting this new plan with a bang, can't wait to get back into my kitchen this evening and whip up this yummy dish! We slimmed down this fattening favorite. Baking the eggplant gives the dish a crispy texture without the fat that comes from frying. Preheat oven to 350°F. Coat a 9 X 13-inch baking dish with cooking spray; set aside. Combine bread crumbs, Parmesan cheese, Italian seasoning and garlic powder in a medium-size bowl; set aside. Remove skin from eggplant and trim off ends; slice eggplant into 1/2-inch-thick slices. Dip eggplant first into egg whites and then into bread crumb mixture. Bake eggplant on a nonstick cookie sheet until lightly browned, about 20 to 25 minutes, flipping once. 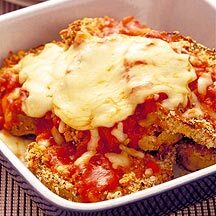 Place a layer of eggplant on bottom of prepared baking dish, then add 1/3 of tomato sauce and 1/3 of mozzarella cheese. Repeat with 2 more layers in same order. Bake until cheese is melted and sauce is bubbling, about 10 minutes more. Slice into 4 pieces and serve. Enjoy, and have a Beauty-Full Day! Yum! That eggplant parm looks delish! Looks delicious! I will have to try this one myself. Thanks for sharing!